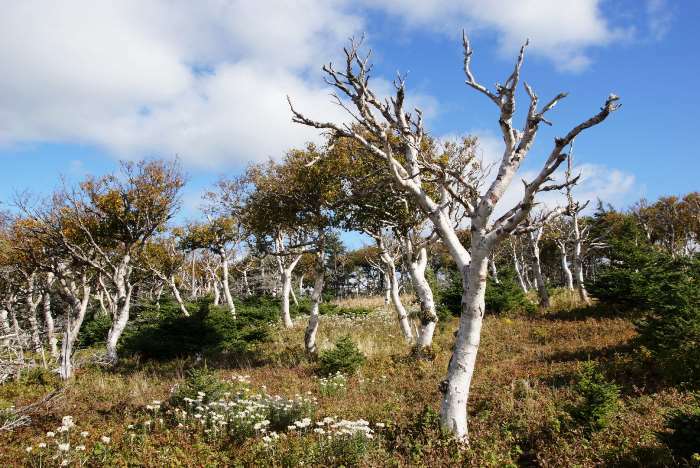 You simply can’t visit Cape Breton National Park without hiking on the island’s most famous trail. 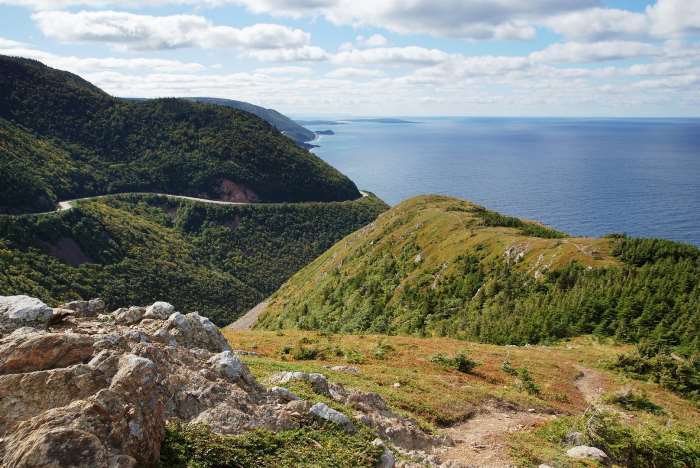 The Skyline Trail takes you to a stunning viewpoint overlooking the Gulf of St. Lawrence and the eastern side of the island – where mountains plunge directly into the water. 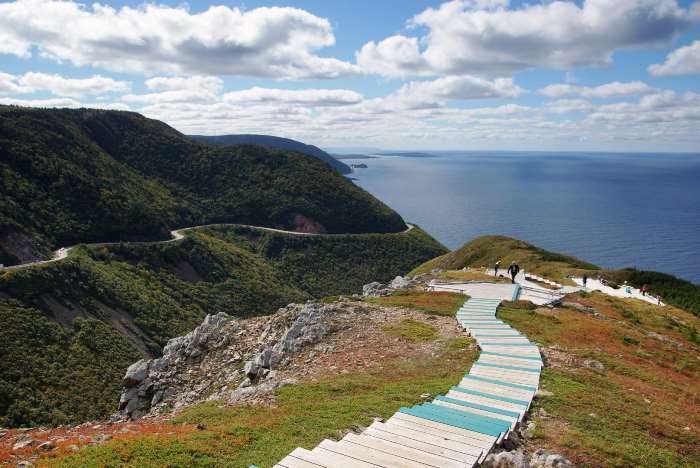 There are no surprises on this trail — you will have seen this place on every promotional website and brochure — but it’s still worth it to make the hike out to the viewpoint. 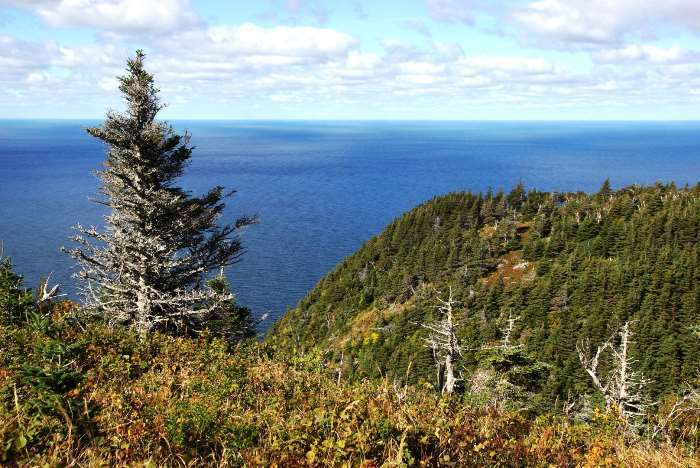 The trailhead for the Skyline Trail is located on the Cabot Trail, about 21 kilometers south of Pleasant Bay, Nova Scotia, and about 14 kilometers north of the park entrance at Chéticamp. To start out, here’s a little perspective on where we’re heading. 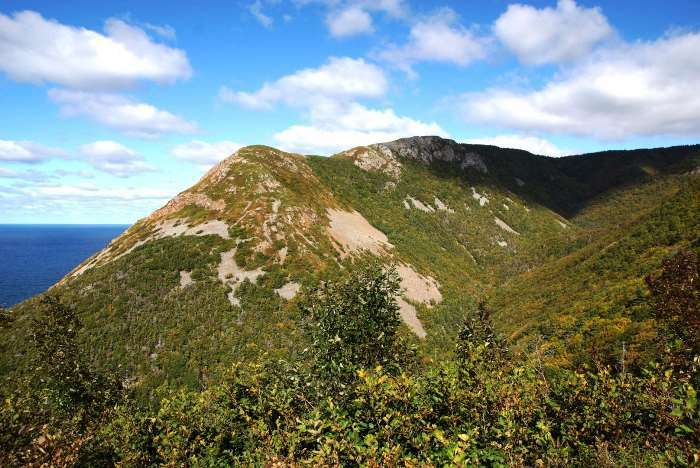 That ridge carries the Skyline Trail out to its famous scenic viewpoint. 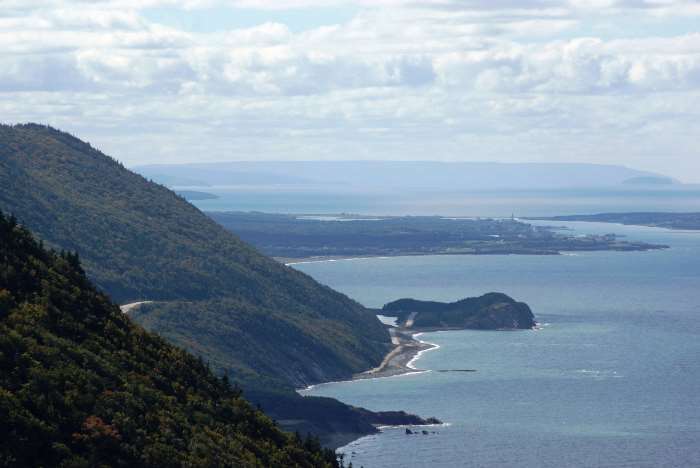 When I took this picture, I was about a kilometer south of the trailhead, on the side of the road on the Cabot Trail. It’s around in this area where the road turns inland (if you’re headed north). 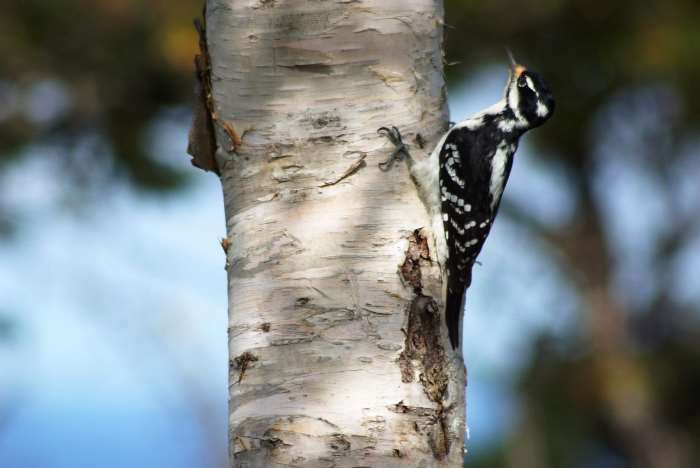 Since this is the park’s most popular trail, you shouldn’t come here looking for solitude — or a convenient parking spot. I had to park a good distance from the trailhead, at the side of the road. 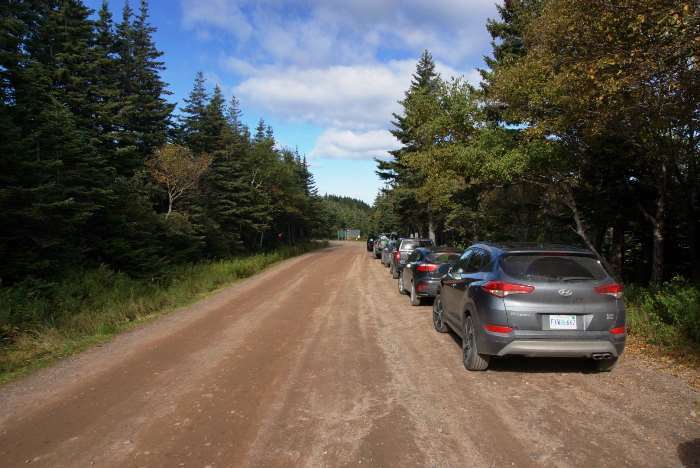 It didn’t help matters that in October, 2016, a good deal of construction was underway on the trailhead parking area. 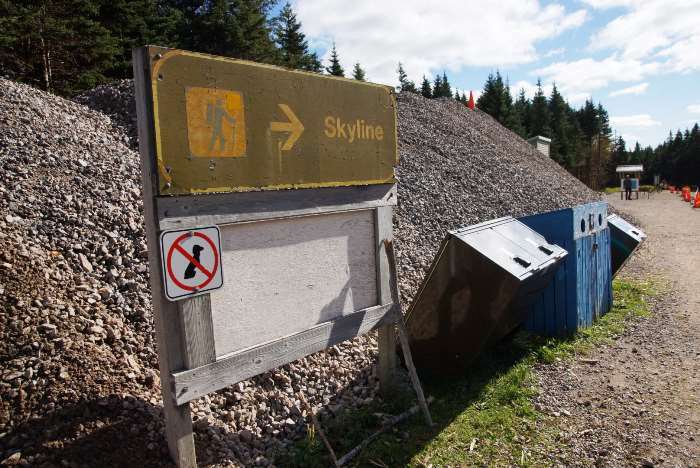 This meant, the road was closed to traffic, and hikers had to hike through the construction zone, dodging heavy equipment, to reach the real trailhead. It seemed like I was going the wrong direction, as I walked past the road crews, but eventually it started to look more like an actual trail. 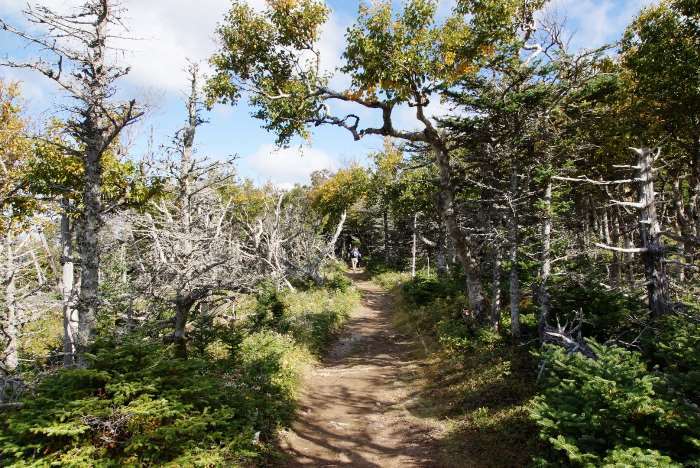 This is the “real” start of the Skyline Trail, and it was a great relief to start hiking between trees. 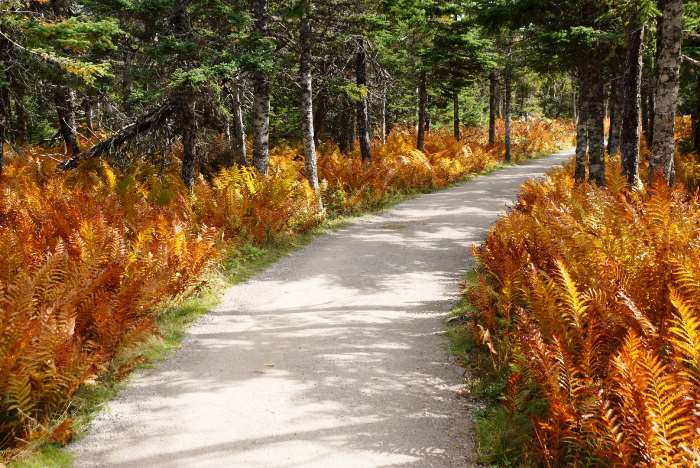 There was also some nice fall color along the trail — not in the trees, but in the ground cover along the sides of the trail. The Skyline Trail offers a loop option, but you’ll probably want to take the shorter side of the loop both ways, or at least use the more direct route on your way out to the viewpoint. I was surprised that most of the trail seemed to be pretty level, or even slightly downhill, on the way out to the viewpoint. On the way out, you’ll notice a strange fenced area off to the side, and then moments later, another one in the middle of the trail. 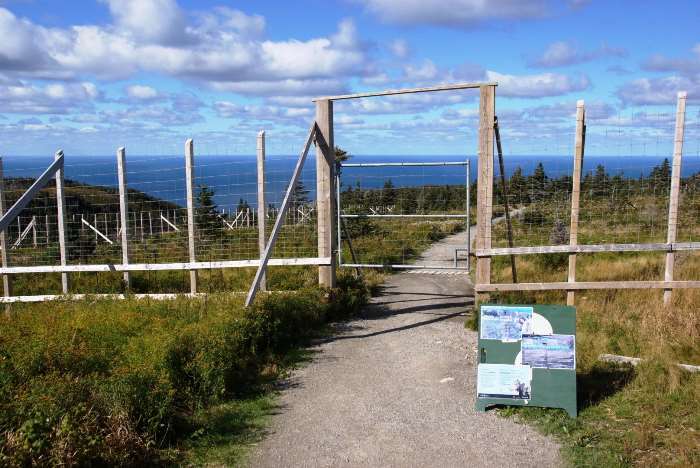 The fenced area is an experiment to observe the impact of moose in the area (making the area inside the fence a moose-free zone). You’ll have to open the gate, pass through, and close it behind you, as you enter and exit the pen. 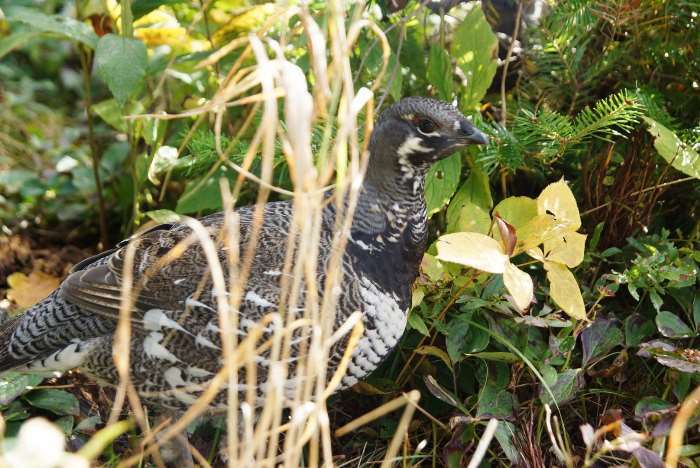 I didn’t spot any moose along the way, but I did spend some time with this pheasant, which was calmly hanging out by the side of the trail, mostly unfazed by crazy humans with cameras. … even though you can see a fairly well established footpath that continues beyond the end. 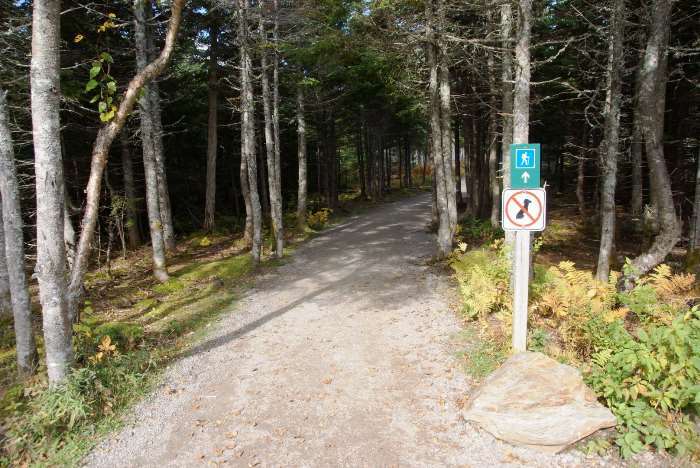 If you wish to flaunt the rules, you could easily hike all the way out to that point. While I didn’t see anyone hiking any further, I did talk to one woman who really, really wanted to. Views from the boardwalk are good enough, that you don’t really need to go any further and break the rules. 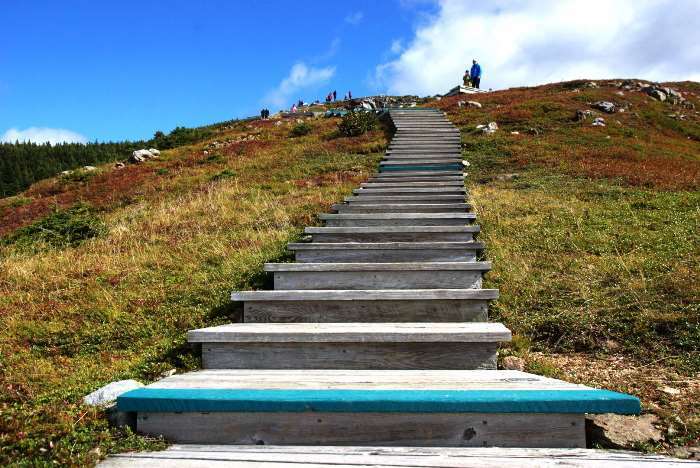 There are numerous landings on the stairs, with benches that let you stop and enjoy the view. 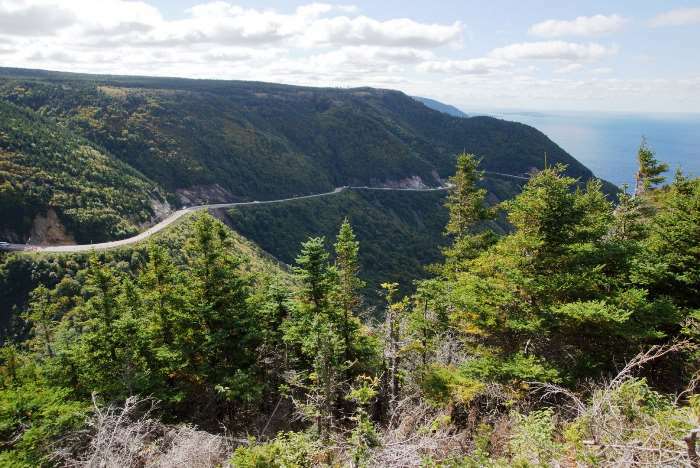 … and see the curvy Cabot Trail as it twists through its most scenic area. 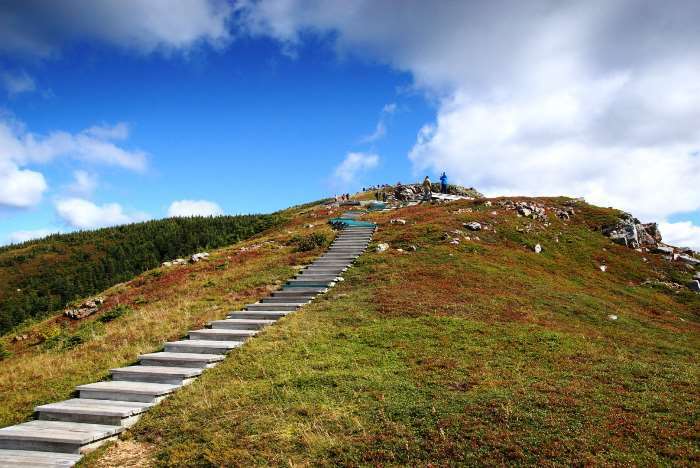 Eventually, you have to climb back up the stairs — which is probably the most challenging part of the whole hike. On the way back to the trailhead, I decided to take the longer side of the loop, just to see what was there. … but there were also a couple of just-okay viewpoints that provided a view to the north. 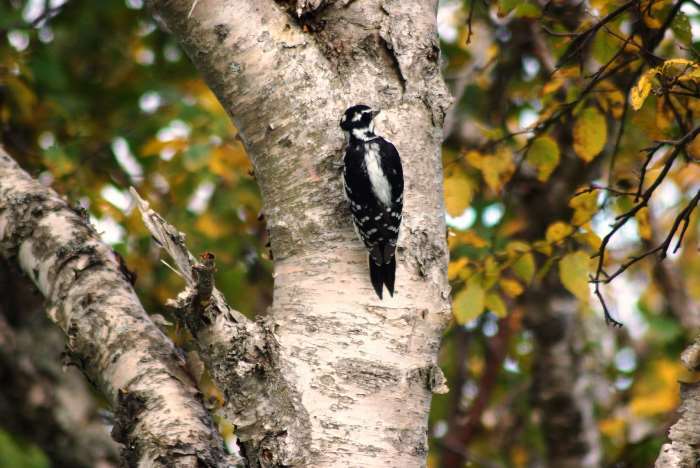 … who thoughtfully posed for some photos as I watched nearby. Before it closes the loop, the trail traverses a wide-open field. It wasn’t until this point that I turned around and realized I had been hiking uphill, just slightly, for quite a while. 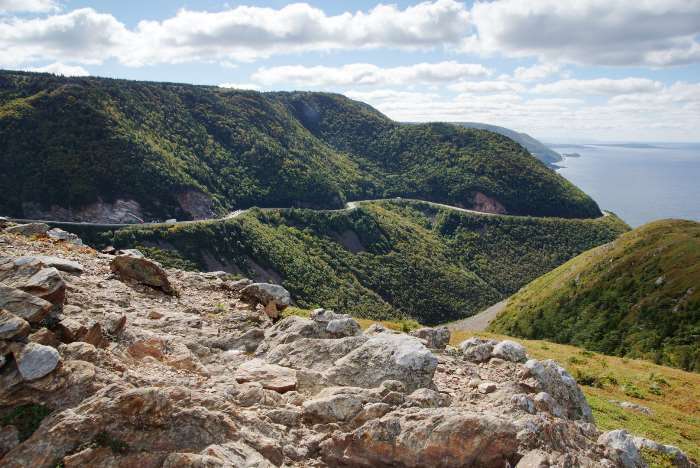 The view behind me made me feel like I was on top of the world — or at least, on top of Cape Breton Island. 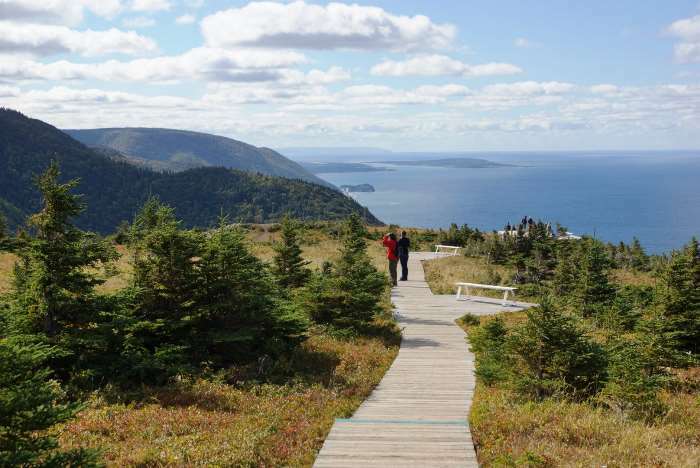 A hike on the Skyline Trail is practically mandatory for anyone visiting Cape Breton National Park. The hike took me about 2.5 hours, which included lots of photography time, and also included the entire loop. You could do it much more quickly if time is an issue.